Add in the coloured sashes, our wedding arch or our big Love Letters. There are some truly amazing wedding ceremony locations within the Royal Botanic Gardens Sydney but for views looking straight towards the Sydney Harbour Bridge and Sydney Opera House you cannot beat the Harbour View Lawns, or sometimes referred to as the Lawn 33 & 34. It truly is a stunning location for an outdoor wedding ceremony. 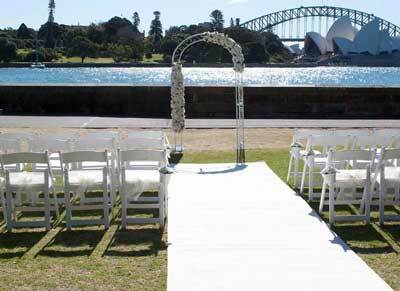 Your wedding ceremony aisle will run straight towards the Sydney Harbour Bridge setting up a spectacular backdrop. Our wedding hire packages include a variety of aisle decorations and you can choose to add in additional items if there is something outside of the package that you really would like as part of the ceremony setup. Adorable Wedding Concepts Princess wedding ceremony package has been created for smaller more intimate weddings or at the opposite end of the spectrum we have our Eternity wedding ceremony package that includes all of our most popular wedding hire and decoration items. What you need to know: Royal Botanic Gardens allow 1 hour setup prior to the start of the ceremony booking time and 2 hour maximum bookings with a maximum of 4 hours if you are willing to pay the additional costs. The Royal Botanic Gardens also have a limit to the number of chairs so you’ll need to confirm with them at the time of booking if you want a large seating capacity.